Adult female shot near Obenge, on the Lomami River. Lack of fishing is a sign that the locals aren’t originally from here. Did they come with the Belgians or the Arab slave traders? When I asked where he had killed her, Jafari, the hunter, waved in a general sort of way to the northeast, across the Lomami (see it in Google Maps). I did not say much else. He was proud and let me take a picture. Jafari killed this adult female with his old Belgian gun. Over the last few days I have heard other shots from the village. 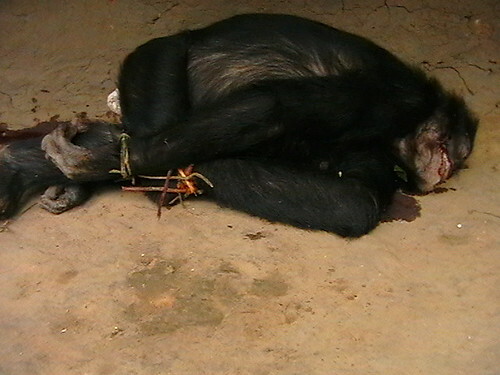 I have also seen monkey snares in the forest nearby. These, too, could catch bonobo. There is much more hunting than I recognized at first. Yesterday a pirogue came back with an elephant chopped into hunks. There are war guns, lots of them, left in this country after the long rebellion. An AK47 is just 300 dollars in Kisangani. That is the weapon that was used to kill the elephant. There are many more animals killed than are needed to feed this small village. Apparently a few women-traders travel across the forest from villages on the Lualaba. They bring salt, sugar, cloth and probably shotgun shells. Then they carry back bushmeat. How often are Bonobo Killed? I don’t know. How far away do Jafari and his friends hunt? I don’t know. Strange that they can be so poor here and yet they can empty the forest of what the world considers its greatest riches. And still they stay so poor. The kids in this village don’t go to school – there is none – and, of course, there is no health center at all. Is it possible to make a difference – for the bonobo and the people? I am sure it is. This entry was written by Terese Hart, posted on 2007-07-11 at 1:03 pm, filed under Bonobo. Bookmark the permalink. Follow any comments here with the RSS feed for this post. Post a comment or leave a trackback: Trackback URL. OH HOW IT SICKENS ME — AND IT IS SO IGNORANT AND THEY DON’T UNDERSTAND HOW TRULY RICH THEY ARE IN HAVING THESE ANIMALS — IF ONLY THEY COULD REALIZE –CAN THEY BE SAVED – THANK YOU FOR BELIEVING! It seems to me that somehow we have to do several things at once: (1) create a large enough protected area in this huge area (TL2)— and that means we have to figure out the right area and then lobby for it (2)mount a media campaign thoughout Congo (newspaper, radio, internet)to raise the visibility of bonobo and the danger of the bushmeat trade (3) work directly in TL2 to understand and dismantle the bushmeat chain locally. I believe that it is possible to make a difference and that it will have to start with the people who live there with and among the animals. Like Wanda said, if the people can be convinced that they are living among rare, natural resources and animals, and that it would be to their benefit to conserve their habitat and not to hunt them to extinction then that would be progress. I am convinced that it will be up to the people to do this. I wish I had billions of dollars to invest in Africa, like Oprah has. Have you guys heard about TED? They were in Africa this year and the former Finance Minister from Nigeria, a woman, gave a very impassioned speech about investing in Africa, particularly African women. 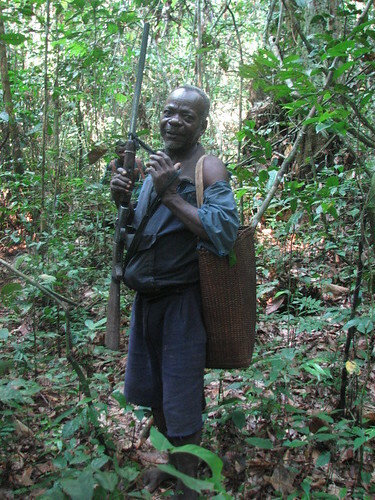 If people can provide jobs for people in Congo so they can provide for their families and hunt other than rare species and endangered species, especially the large-brained great apes. This is just my opinion, but I suspect the very wealthy have at least some blame in this tragedy, too. Who else but the wealthy can afford to purchase live gorillas or chimps for USD $50,000 – $100,000? It’s also because the wealthy are overindulging and taking so much from Africa that poor Africans feel like they don’t have anything else to lose by engaging in these awful trades. Hmmm. No I don’t know about TED. Tell me more. yes the international community has been to blame in a number of ways — most rather indirect. There is a huge international trade in coltan, gold, diamonds, cassiterite and even timber coming out of DR Congo— but the profits are made elsewhere or by a few congolese individuals and they don’t get moved back into a local fight on poverty. Also grass-roots aid really fell apart in Congo and it is not getting underway again yet. Last peace corps education volunteer was here in the late 80s I think and now there is no peace corps at all. TED is an organization based around technology, entertainment, design, and other ideas. Go to http://www.ted.com to get more information. The gist of the organization is to bring the world’s best in industry (tech, design, nature) to exchange ideas, to talk and to act on making the world a better place. This past June they were in in Tanzania. I saw the video of the former Finance Minister from Nigeria, Ngozi Okonjo-Iweala’s speech on the TED’s website. It was very inspiring and she even talked about investing in the East African wildlife projects and employing the local people in tourism efforts, etc. The videos and information are all on the website. Jane Goodall spoke one year, I recommend watching her speech, too. Can this man be condemn for killing this animal ? What can we do for giving a good protection to these animals. On my part, the Government of the DR of Congo is on a good position to stop this kind of business. People may be train about the important of these resources. Many countries don’t have these resources but our country have it. I think, education (schools), infrastructure, justice, …. all of these is part of Government.